The Somme (/sɒm/) is a river in Picardy, northern France. The name Somme comes from a Celtic word meaning "tranquility". The department Somme was named after this river. The river is 245 km (152 mi) long, from its source in the high ground of the former Forest of Arrouaise at Fonsommes near Saint-Quentin, to the Bay of the Somme, in the English Channel. It lies in the geological syncline which also forms the Solent. This gives it a fairly constant and gentle gradient where several fluvial terraces have been identified. The Somme featured prominently in several historical campaigns. In 1066, the invasion fleet of William the Conqueror assembled in the Bay of the Somme, at Saint-Valery-sur-Somme. The river also featured in the 1346 withdrawal of Edward III of England's army, which forded the river at the Battle of Blanchetaque during the campaign, which culminated in the Battle of Crécy. Crossing the river also featured prominently in the campaign which led to the Battle of Agincourt in 1415. In 1636, a Spanish army led by Thomas Francis, prince of Carignan, crossed the Somme defeating a French army during the Thirty Years War threatening Paris. Most famously, the Battle of the Somme, during World War I, lasted from July to November 1916 and resulted in more than a million casualties. Private A S Bullock in his wartime memoir recalls his first sight of it in early April 1918: '... we reached a small place called Hengest sur Somme. The train stopped and we descended. There in front of us was a muddy, sluggish and somewhat narrow stream, which has given its name to one of the most awful battles in history - the Somme.' The great battles that finally stopped the German advance in the Spring Offensive of 1918 were fought around the valley of the Somme in places like Villers Bretonneux, which marked the beginning of the end of the war. The source of the Somme, at Fonsommes. The estuary is now much smaller than it once was but still extensive. The river is characterized by a very gentle gradient and a steady flow. The valley is more or less steep-sided but its bottom is flat with fens and pools. These characteristics of steady flow and flooded valley bottom arise from the river's being fed by the ground water in the chalk basin in which it lies. At earlier, colder times, from the Günz to the Würm (Beestonian or Nebraskan to Devensian or Wisconsinian) the river has cut down into the Cretaceous geology to a level below the modern water table. The valley bottom has now therefore, filled with water which, in turn, has filled with fen. This picture, of the source of the Somme in 1986, shows it when the water table had fallen below the surface of the chalk in which the aquifer lies. Here, the flow of water had been sufficient to keep fen from forming. This satellite photograph shows the fenny valley crossing the chalk to the sea on the left. The sinuous length at the centre of the picture lies downstream from Péronne. 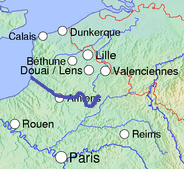 The construction of the Canal de la Somme began in 1770 and reached completion in 1843. It is 156 km (97 mi) long, beginning at St.Simon and opening into the Bay of the Somme. From St.Simon to Froissy (near Bray sur Somme, south of Albert), the canal is alongside the river. Thence to the sea, the river is partly river and partly navigation. From Abbeville, it is diverted through the silted, former estuary, to Saint-Valery-sur-Somme, where the maritime canal, once called the canal du Duc d'Angoulême enters the English Channel. An example of the lakes formed in the fen of the valley bottom. They attract wildfowlers and anglers. The St Quentin Canal, famous for the 1918 battle, links the Somme to northern France and Belgium and southward to the Oise. The Canal du Nord also links the Somme to the Oise, at Noyon, thence to Paris. In 2001, the Somme valley was affected by particularly high floods, which were in large part due to a rise in the water table of the surrounding land. Catchment area 5,560 km2 (2,150 sq mi). Daily flow rates compared with mean rates for the time of year at Hangest-sur-Somme (m³/s). Catchment area 4,835 km2 (1,867 sq mi). 1993.1994[permanent dead link]. 1995. 1996[permanent dead link]. 1997. 1998. 1999. 2000[permanent dead link].2001.2002[permanent dead link].2003.2004[permanent dead link].2005. Mean flow rates monthly and daily at Péronne (m³/s). Catchment area 1,294 km2 (500 sq mi). 1986[permanent dead link].1987.1988[permanent dead link].1989.1990[permanent dead link].1991.1992.1993.1994[permanent dead link]. ^ Gargani J.; Stab O; Cojan I.n Brulhet J. (2006). "Modelling the long-term fluvial erosion of the river Somme during the last million years". Terra Nova. 18 (2): 118–129. doi:10.1111/j.1365-3121.2006.00671.x. Wikimedia Commons has media related to Somme River. Somme is a department of France, located in the north of the country and named after the Somme river. 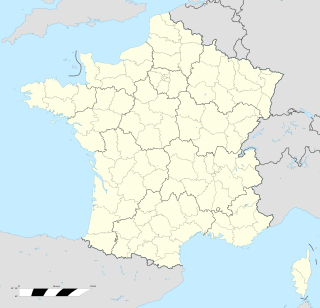 It is part of the Hauts-de-France region. The Oise is a river of Belgium and France, flowing for 341 kilometres (212 mi) from its source in the Belgian province of Hainaut, south of Chimay. It crosses the border with France after about 20 kilometres (12 mi). It flows into the Seine at Conflans-Sainte-Honorine, a north-western suburb of Paris. Its main tributary is the Aisne. It gave its name to the French departments of Oise and Val-d'Oise. The Hundred Days Offensive was an Allied offensive which ended the First World War. Beginning with the Battle of Amiens on the Western Front, the Allies pushed Central Powers back after their gains from the Spring Offensive. The Germans eventually retreated to the Hindenburg Line, culminating in the Armistice of 11 November 1918. The term "Hundred Days Offensive" does not refer to a battle or strategy, but rather the rapid series of Allied victories against which the German armies had no reply. The Pays de Bray is a small natural region of France situated to the north-east of Rouen, straddling the French departments of the Seine-Maritime and the Oise. The landscape is of bocage, a land use which arises from its clay soil; suited to the development of pasture for the raising of dairy cattle. It produces famous butters and cheeses such as Neufchâtel. The Second Battle of the Somme of 1918 was fought during the First World War on the Western Front from late August to early September, in the basin of the River Somme. 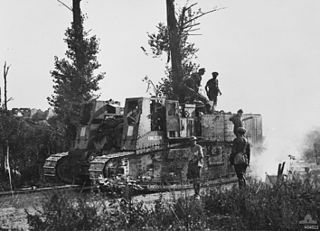 It was part of a series of successful counter-offensives in response to the German Spring Offensive, after a pause for redeployment and supply. Havrincourt is a commune in the Pas-de-Calais department in Hauts-de-France in France. The inhabitants are called Havrincourtois. Saint-Valery-sur-Somme is a commune in the Somme department. The village is a popular tourist destination because of its medieval character and ramparts, Gothic church and long waterside boardwalk. Ailly-sur-Noye is a commune in the Somme department in Hauts-de-France in northern France. Bécordel-Bécourt is a commune in the Somme department in Hauts-de-France in northern France. Berteaucourt-lès-Thennes is a commune in the Somme department in Hauts-de-France in northern France. Béthencourt-sur-Somme is a commune in the Somme department in Hauts-de-France in northern France. Brie is a commune in the Somme department in Hauts-de-France in northern France. Noyelles-sur-Mer is a commune in the Somme department in Hauts-de-France in northern France. Grand-Laviers is a commune in the Somme department in Hauts-de-France in northern France. The Bresle is a river in the northwest of France that flows into the English Channel at Le Tréport. It crosses the departements of Oise, Somme and Seine-Maritime. Abbeville is a commune in the Somme department and in Hauts-de-France region in northern France. The Canal de Saint-Quentin is a canal in northern France connecting the canalised Escaut River in Cambrai to the Canal latéral à l'Oise and Canal de l'Oise à l'Aisne in Chauny. The Canal de la Somme is a canal in northern France. Its total length is 156.4 km with 25 locks, from the English Channel at Saint-Valéry-sur-Somme to the Canal de Saint-Quentin at Saint-Simon. The Gare de Noyelles is a railway station serving the town Noyelles-sur-Mer, Somme department, northern France. It is served by mainline trains on the Boulogne - Abbeville line, and also by the Chemin de Fer de la Baie de Somme heritage railway trains to Le Crotoy, Saint-Valery-sur-Somme and Cayeux-sur-Mer.